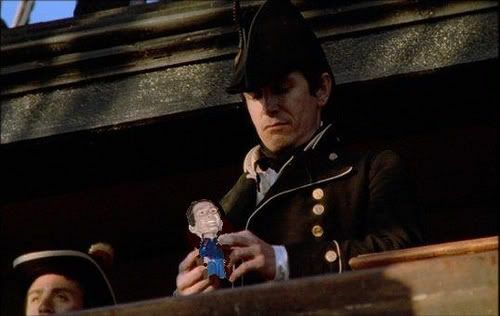 Last year Grace White created some cute and funny images using pics of my silly Paulie bobblehead and screencaps from the Hornblower flicks. She's given me permission to repost them. The funnier thing is that the Bobbleheads (there are three of them) DO get around. LOL!! Three Paul Bobbleheads? Can the world handle it? So where did these Bobbleheads come from? 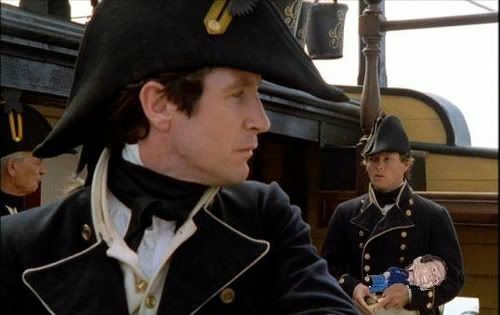 Are they of Paul from HH? Estelle had them made from some photos she took at Chicago Tardis in '04. The members of the Library pitched in and got Paul a Chicago Bears jacket with the words "Who 8" on the back for his birthday. So the Bobbleheads are wearing their "Who 8" jackets. LOL!! I believe Estelle kept one, Paul is supposed to have another one and Estelle gave the third one to either Jason Haigh-Ellery or Gary Russell from Big Finish at Gallifrey '05. 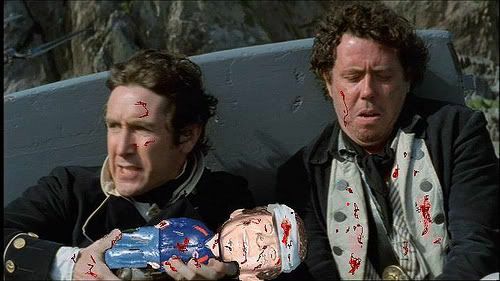 I have shared a room with a Boblehead (and Estelle) many a time during our travels. LOL!! That is AWESOME!!! 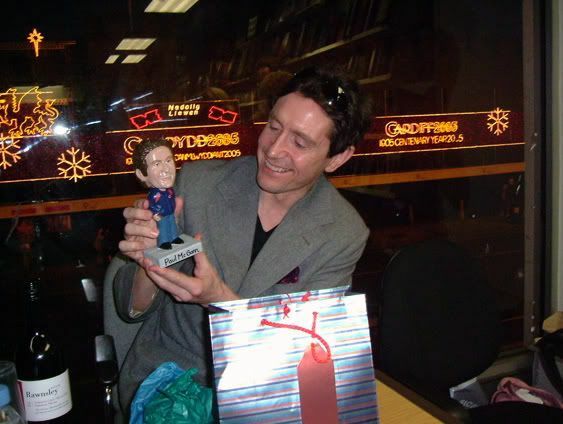 I'm sure Paul appreciated such a gift, but to be able to share a room with the Bobblehead itself.... well.... I'm sure the skies opened up and there was light and angel song... oh man, my mind went into overdrive! I was giving Paul the stamps as a birthday present. 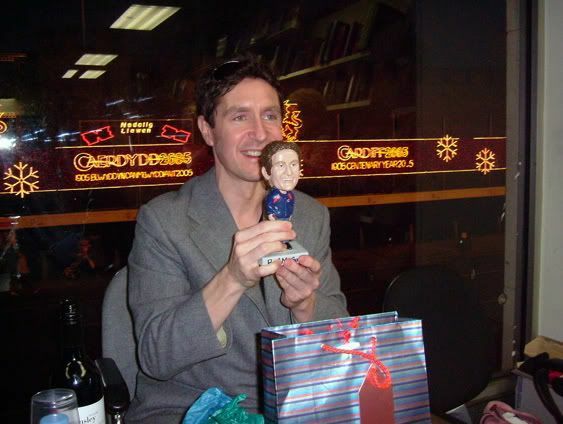 When Jason Haigh-Ellery suggested that I give Paul a bobblehead saying he'd love it, I felt that wasn't such a great idea. 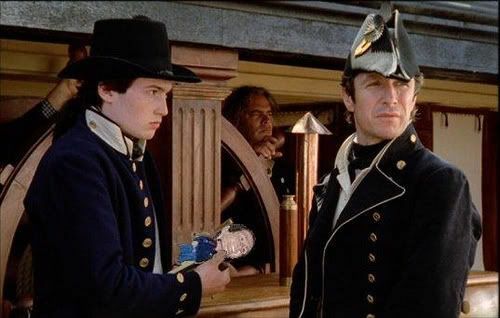 However, when I was in Portsmouth last October for a Horatio Hornblower convention, I met up with Suz Macey who was visiting for the day and had the harebrained idea to ask her if she'd be willing to give Paul the bobblehead for me at the upcoming Ascension Doctor Who convention in Cardiff. I was pleasantly surprised when she agreed and gave her the doll and a card for Paul. She sent me the following pictures. 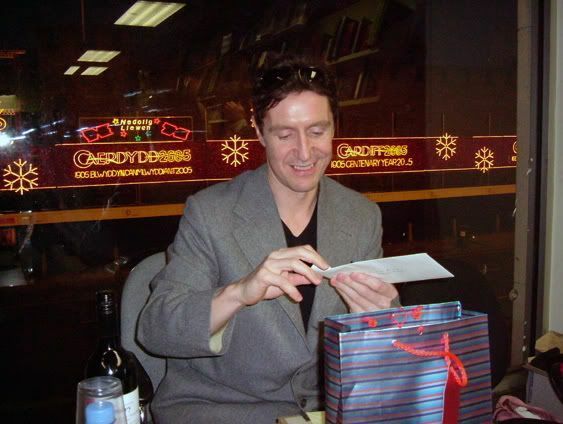 The first shows him opening the envelope of the card I'd written. 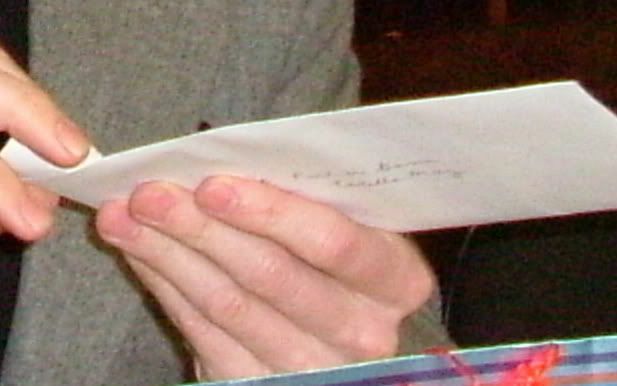 This second is a close-up to show the card is really from me. The next two show him posing with the dolly. Back at the old Library, someone had posted a picture of him gazing at the back of the doll, and I hoped that he might have recalled something of ChicagoTARDIS. I didn't save that picture when I had the chance, and it's since disappeared. I was kinda expecting him to peek inside the gift bag, say ugh, and then pass the lot to con organizer Heather Amos to dispose of. I have one remaining bobblehead, which my husband says is still one too many. LOL! I had seen the pictures of the bobblehead, but not those Suzanne has made. they're great. Thanks for posting them. I love the story behind it . Cool Pics Estelle! Thanks. I think it was a gift that most would not think of making or going through the trouble of it. 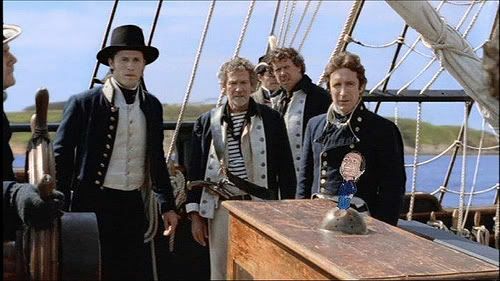 Those bobble head pics are very, very silly in all incarnations and make me smile whenever I see them. Thanks. Teri originally found the people who could make customized bobblehead dolls (see http://whoopassenterprises.com/) and made the suggestion that we give one to Paul at ChicagoTARDIS 2004. However, we weren't sure how the doll should be attired. Anyway, we opted for the Chicago Bears jacket, and she got Who 8 put on it. Anyway, I thought having a doll dressed the way Paul was at CT would be cute.